This morning I woke up to another cold, icy, snowy day. Though the snow holds a crisp, clean beauty, the difficulties caused by the subzero temperature start to grate on a person after so many days. The novelty wears off and only the work remains. As I was grudgingly thinking about all the daily chores that needed to be done I happened to look out the window and saw a breathtaking sight. The sun had come up and was shining with smiling rays of light through my dining room window. I quickly ran with my camera to our firewood door and, ignoring the biting cold, ran onto the porch where I snapped picture after picture of this beautiful reminder of God’s faithfulness. 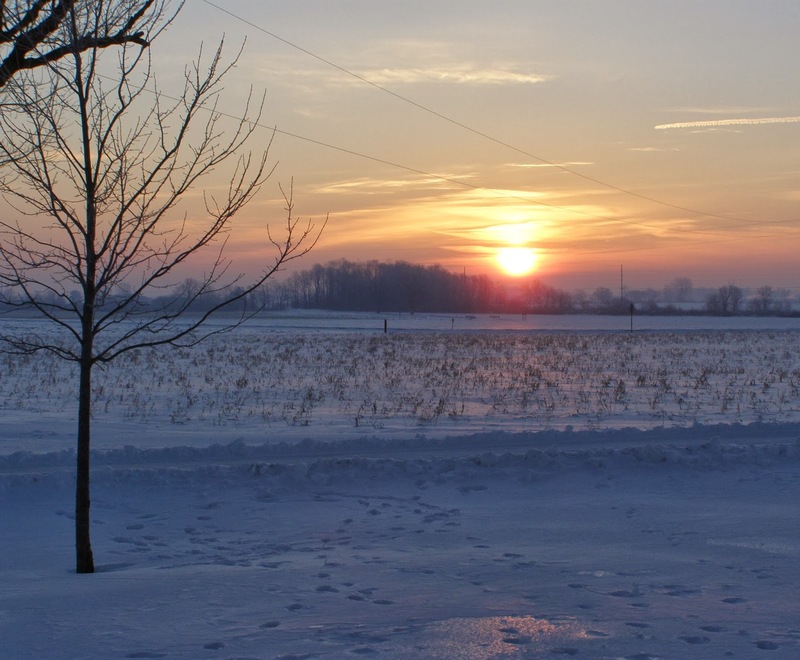 I continued to think about this sunrise as I crunched through the squeaky white drifts to take care of our animals in the barn. As I recalled all the blessings God has given me, I meditated on God’s faithfulness. I praised Him for a Carhart coat and overalls to keep me warm, heavy boots to protect my feet, electric water buckets for the goats and dog to keep the water from freezing, enough time to leave the defrost on in the car before leaving for work so I wouldn’t have to scrape the windows, and 3 strong boys to split wood for the wood stove (Thank you, Luke, John-Keith, & Nathan!). What a difference a heart of thankfulness can make in a person’s life! My whole outlook changed. As you are going through life, difficulties will come. But take hope and recall the steadfast love of the Lord which never ceases. Be reminded daily that His mercies never come to an end. Every morning there is a new sunrise – let it remind you of the Lord’s constant faithfulness. I LOVE this Sandy. I just shared this verse today with a hurting friend. She had NEVER heard it before and was so encouraged to hear the comforting words.